Conceived as a series of pavilions surrounded by tropical gardens and water features, deReus Architects designed this Kaupulehu residence on the Big Island in Hawaii. 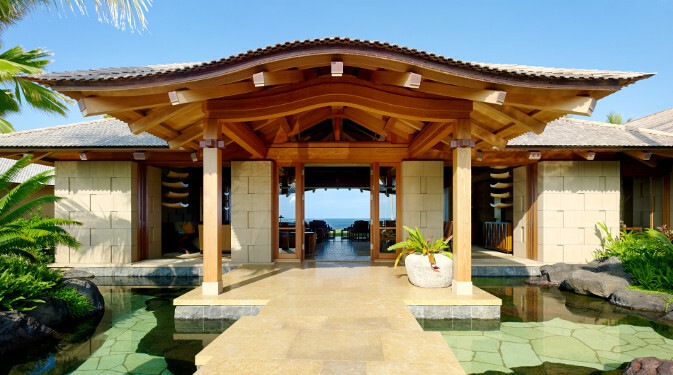 These pavilions, or hales as known in Hawaii, present a unique and distinctive curved roof design. Both teak and Western Red Cedar (WRC), chosen for their rot and insect resistance, are utilized in various complex curves and arches. To manage engineering requirements for hurricane conditions, Purforma™ beam wraps cover steel members and Tetraleaf™ veneered Glulam provide structural strengths not available in solid timber. Copper end caps protect WRC Lamella™ rafter tails.